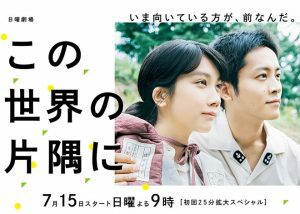 Synopsis: A drama depicting the every-day life of a woman who married into a family in Kure, Hiroshima during World War II. Material shortages and the military drafting of family and friends cast a dark cloud over war-time Hiroshima, but the heroine lives each day to the fullest, with hard work and positivity. Based on Fumiyo Kono’s classic manga that has sold over 1.2 million copies. Urano Suzu (Matsumoto Honoka) was born in the Eba area of Hiroshima City, the mild-natured oldest daughter of a family that processes seaweed for a living. She loves to draw and is often caught in a daze. One day, a man visits the Urano household and asks her family for her hand. Hojo Shusaku (Matsuzaka Toori) is a clerk at the court-martial in Kure City and says he has met Suzu before, but she has no recollection of it. Suzu has a hard time imagining herself as a wife, but before it all sinks in, her parents, Juro (Dronz Ishimoto) and Kiseno (Nobuko Sendo), accept the proposal and begin preparations. Suzu’s grandmother Ito (Miyamoto Nobuko) gives her a beautiful kimono to take with her to her new home. A heartwarming drama starring Ayase Haruka, based on a comic strip about a stepmother and daughter’s loving relationship as it grows over the years. The script was written by Morishita Yoshiko, who also wrote “Crying Out Love, in the Center of the World,” “JIN,” and “Journey Under the Midnight Sun,” which all starred Ayase as the heroine. In this drama she plays a woman for whom work was her life. She is proposed to by a single father, played by Takenouchi Yutaka, and the couple and child become a family, experiencing life’s little moments of happiness, sadness, and laughter together. Eight-year-old Miyuki (Yokomizo Naho) lost her mother several years ago and has since lived with just her father, Ryoichi (Takenouchi Yutaka). One day, she is suddenly introduced to Akiko (Ayase Haruka), who is to be her new mother. Akiko uses her stellar business skills to try to win the little girl over, only to fail miserably. Ryoichi tries to reason with Miyuki, but to no avail. Akiko changes tactics and tries to get Shimoyama, a woman in the neighborhood who knows Miyuki well, on her side. Synopsis: Furuya Towa (Nakagawa Taishi) is a handsome high school student. Since he was little, he has always been surrounded by women. He believes that he is popular with women, but he has never had a girlfriend in his life. One day, Towa’s classmate tells him “you’re the type of guy where girls only look at.” Towa gets upset and states that he will make Misono Miwa his girlfriend. Misono Miwa is a beautiful girl and she is popular with guys, but she turns down their advances. Towa Furuya confesses his feelings to Misono Miwa, but she also turns him down. Towa doesn’t give up and his feelings get stronger for her. He discovers that she likes art teacher Masaki Takatsugu. Synopsis: A coming-of-age story of high school cheer dancers passionately chasing the “impossible” dream. When Fujitani Wakaba (Tsuchiya Tao) was a little girl, Fukui Chuo High School’s cheer dancing team JETS won the US championship, the first time ever for a Japanese team. Wakaba was captivated by their performance, and ever since then, she has hoped to become a cheer dancer on the team herself. But she does not pass the school’s entrance exam, losing confidence in herself, and winds up at Fukui Nishi High in the next town over, a school mediocre in studies and in sports. 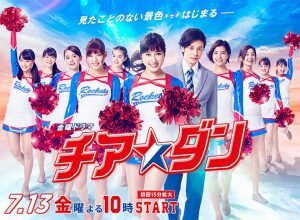 There, she spends her days cheering at games as a member of its tiny, weak cheerleading squad.One day, a new student transfers in – Kiryu Shiori (Ishii Anna), a headstrong teen from Tokyo. She presses Wakaba to form a cheer dancing team with her, and although Wakaba is taken aback at first, she slowly regains her passion for cheer dance.